It was just a montage of words uttered over a video in the summer of 2018. Soon the words went viral. They helped unseat a Wall St-friendly Democrat – one primed to be the next Congressional leader. They were uttered by Alexandria Ocasio-Cortez. This race is about people vs money. We’ve got people. They’ve got money. A New York for the many is possible. It doesn’t take a hundred years to do this. It takes political courage. She was right. It did not take a hundred years. All it took was one summer, political courage, a big idea – The Green New Deal – and hard graft. A Green New Deal would subordinate the financial system to the interests of society and the ecosystem, and help transform the economy away from its addiction to fossil fuels, she argued. The big idea, her hard work and courage were all that was needed to harness latent power: the power of the people of the Bronx. Her story will underpin the theme that follows. Citizens’ latent and untapped power in countries with sound taxation systems to hold financial elites to account – and implement a Green New Deal. It can be used to transform the balance of power between the people and the private finance sector. It is power that lies in abeyance, repressed by the dominant moneyed class. But suppressed also by the narrow, myopic view that we, and our politicians, have of the potential economic power of citizens. To harness citizens’ power, it is important to understand that taxpayers have agency over global financial markets. Around the world, taxpayers subsidise, embolden and enrich centres of financial power like those of Wall St and the City of London. The bank bailouts after the Great Financial Crisis demonstrated that citizens and their publicly financed institutions have the power to protect capitalism’s rentiers from the discipline of the ‘free market’. Thanks to the backing and firepower provided by millions of honest, taxpaying citizens, central banks deployed immense financial power and bailed out the globalised banking system – stemming a cascade of debt deleveraging that could have contracted the money supply, credit, and economic activity and deepened the crisis. Thanks to taxpayers, central bankers prevented another Great Depression. It was a great power deployed in the name of citizens, but without their authority – or even their knowledge. To grasp and deploy this financial power in the interests of society and the ecosystem, citizens need to understand that this was and is ultimately our power. It is latent power, not used by citizens to defend the public interest, but by technocrats to defend the interests of private wealth. The reason for our political impotence can be found in the fog and mystery surrounding the creation of money and the operation of the monetary system. Thanks to the economics profession’s neglect of money, debt and banking, there is a great deal of misunderstanding and confusion about money and the financial system. Arguments rage about whether money is just ‘created out of thin air’ – or whether gold or bitcoin are real money. Whether bankers and/or governments can just ‘print’ money ad infinitum. Or whether there are limits to the printing of money. The ignorance and confusion is probably no accident. It helps protect the private finance sector from scrutiny: ‘all the better to fleece you with’ to quote the wolf in the fairy tale. Sensible people (including the Bank of England) agree that money, as Joseph Schumpeter explained, is nothing more than a promise to pay, as in, ‘I promise to pay the bearer’. As such, money is a social construct, based on trust or promises to pay and upheld by the law. When someone applies for a loan from a bank, the money is not in the bank. Instead, licensed commercial banks ‘create’ money every time a borrower promises to pay. They make the loan by entering numbers into a computer, and (digitally) depositing funds into a borrower’s account. The borrower promises to pay back the money created by the banker. As guarantee the borrower offers collateral, signs a contract, and agrees to pay interest on the loan. For that trust to be upheld, the institutions that create money (licensed commercial banks) are supported and regulated by a publicly backed central bank issuing the currency. Regulation ensures that trust between banker and borrower is enforced. Private bankers can only create new money and operate effectively as part of the monetary system, which includes a central bank. While commercial bankers can digitally create new money at the bidding of a borrower, they cannot print currency or mint coins. Only the central bank can do that. The central bank’s great power is to issue the currency – sterling or the dollar or the rupee –in which new money is created. And to help determine the value of the currency. That power can be exercised by central banks only because of the collateral backing the currency they create. That collateral is made up of citizens’ tax revenues. The more taxpayers that back the currency, the sounder the tax-collection system, the greater the value of the currency. This process is illuminated if we compare the collateral that backs up the US Federal Reserve with that of Malawi. The central bank of Malawi, like the Federal Reserve, issues a currency. But Malawi has far fewer taxpayers than the US. Thanks largely to colonialism and to IMF policies, Malawi also lacks important public institutions: an independent central bank; a sound tax-collection system; a system for enforcing contracts or promises to pay (criminal justice); and a well-regulated accounting system for assessing assets and liabilities. 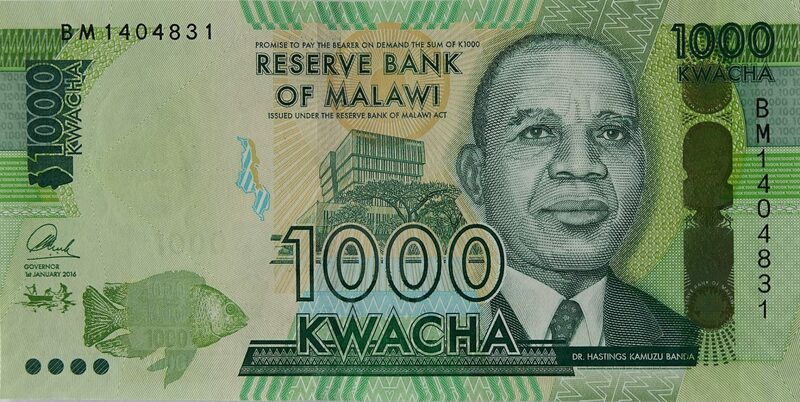 Consequently, Malawi’s currency – the kwacha – has little value compared to the dollar. Even worse, due to the absence or weakness of public institutions, Malawi is reliant on other people’s money – obtained via other monetary systems. Access to foreign monetary systems mostly takes the form of loans in dollars, sterling or yen – that are heavily conditional. While some of the money may benefit the Malawian people, the cost of repayment to foreign financial institutions invariably takes its toll on the nation’s financial resources, its human and ecological assets. It is the lack of monetary autonomy provided by sound public institutions, including a tax-collection system, that renders citizens in countries like Malawi relatively powerless, and vulnerable to predatory foreign lenders. It is the lack of monetary autonomy provided by sound public institutions, including a tax-collection system, that renders citizens in countries like Malawi relatively powerless, and vulnerable to predatory foreign lenders. It also explains how and why poor countries remain dependent and subordinate to rich countries. Regrettably the IMF and World Bank actively discourage low-income countries from investing in the vital public institutions essential to a sound monetary system – one that would restore their financial and economic autonomy. Citizens in countries with sound monetary institutions and a tax-collection system enjoy considerable potential power and agency over the globalised financial system. Understanding how taxes prop up the value of a nation’s currency for private financiers is a first step in understanding citizens’ potential power. The world’s mobile financial speculators and rentiers prefer to deal in currencies underpinned by stable public institutions, financed and backed by millions of taxpayers. While of course there is trading in many emerging market currencies, speculators prefer to hold sterling, dollars, euros and yen. These currencies are backed by strong economies. But their value is ultimately derived from citizens – willing, honest, law-abiding taxpayers – who provide the revenues that underpin the currency. Taxpayers do not just pay direct and indirect taxes every day, month or year. Because new taxpayers are born every day, citizens will pay taxes for decades into the future. If our publicly financed state institutions remain stable, tomorrow’s new-borns will go on paying taxes into the future. To understand the duration of taxpayer power, it helps to look back at the history of the British financial system. Back in 1748 the British government issued perpetual bonds, which were debts with no maturity date for repayment, but which paid interest to lenders at 3 per cent each year. The government had no difficulty selling these bonds (known as ‘consols’) to the public. Public confidence – that the British government would fulfil its obligations to pay interest on the loans in perpetuity – was high. That confidence was justified, as interest was paid on the bonds each year until finally they were redeemed in 2015. No other asset has that kind of long-term, safe backing. Becky’s envy derived from the security granted to those with funds enough to invest in the British government’s debt – known then, and for several centuries, as Three Per Cent Consols (shorthand for Consolidated debt). 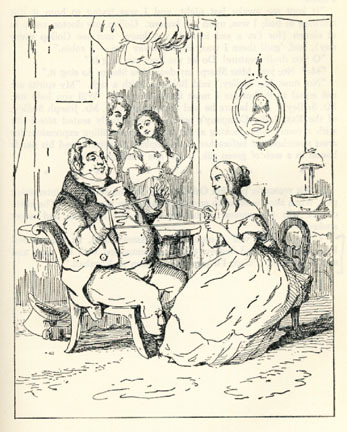 On an inheritance of £10,000 wealthy young women of the nineteenth century could live on the tidy sum of £300 a year; £25,000 would generate a comfortable £750 a year. Public debt is an asset that earns income – just as a buy-to-let property earns rent for its owner. But while a buy-to-let investor has to sweat to maintain, advertise and rent out the asset, debt earns income effortlessly for the wealthy and for financiers. It does so by paying interest added at a certain percentage per year. Unlike an investor’s property, debt is light as air, intangible, invisible. The only evidence of its existence is found in database entries, numbers on a balance sheet or in words on a ‘bearer bond’. The differences do not end there. A building or property is subject to the laws of physics. It can age, crumble, or be razed to the ground. Football clubs are great assets – because fans are committed long-term, and willingly and regularly pay ‘rents’ to the owner of the asset, for the privilege of watching their team, or by buying a club T-shirt. But clubs can lose value by falling down league tables. Works of art – say a Rembrandt painting – are assets with greater longevity, but are also likely to deteriorate, and in any case, are subject to the whims of fashion. Not so the government bonds of countries like Britain. While sovereign debts can be defaulted on, safe government debts do not rot with age, as Professor Frederick Soddy (1877–1956) once explained. That is because debts are not subject to the laws of thermodynamics, but to the laws of mathematics. As such, debt effortlessly earns income for investors, at mathematical rates. And if the debt is the safe public debt of nations like Britain, the US or Japan, it can do so for a long, fixed period of time. The British government has since 1694 honoured its debt obligations without fail. In a world of globalised capital flows in which capital sloshes from one part of the world to another, the price of UK government bonds may rise and fall, but their safety and longevity is never in question. That is because the system is managed by public authority, not left to ‘the invisible hand’ – but mainly because most British citizens regularly and faithfully pay taxes. And to understand why safety is such a big issue for the private finance sector, remember this: the global financial system froze in August 2007 and then collapsed. Not because financiers ran out of money. Not because of a run on the banks. But because everyone in the sector – everyone – lost confidence in the value of assets used as collateral, particularly the value of sub-prime property mortgages on bank balance sheets. Why did that matter? Because the value of sub-prime assets (mortgages) had been used to leverage inordinate amounts of additional finance through borrowing. If the asset or collateral against which the borrowing had been leveraged was worthless – then the leveraged debt was unlikely to be repaid from the sale of the promised sub-prime collateral. The collapse of confidence in asset values (or collateral) led to the collapse of the globalised financial system. And that is where we, citizen taxpayers, came in. Citizen collateral, in the form of tax revenues, did not collapse in value in the crisis. Instead public collateral maintained the authority of central banks, and gave them the power to issue new central bank money (liquidity) in exchange for assets from private bankers. The process was called Quantitative Easing (QE). The backing of taxpayers enabled central bankers to bail out Wall St and the City of London. The safety and soundness of our taxes upheld the value of currencies, despite the crisis. This was most evident in the US. Even as the global economy tanked, and financial turmoil soared, the value of the dollar rose. Central banks used the collateral power provided by citizens to leverage vast amounts of central bank money – about $16 trillion – to bail out the global banking system. To fully understand the power wielded by central bankers, it is important to understand that each time the government applies for a loan, or issues a bond, it creates a debt – or liability – for the government. At the same time, by borrowing, the government creates a valuable financial asset for the private sector. Governments regularly (once or twice a month) invite pension funds, insurance companies and other private financiers to finance their bonds or loans, in exchange for promises to pay interest annually, and to repay the principal in full at the end of the term of the loan (bond). This process is in effect no different from a woman seeking a mortgage. She invites a banker to accept her ‘bond’ or promise to repay in exchange for new finance, backs this up with collateral, and commits to pay interest annually and the principal in full at the end of the loan’s term. Once the commercial banker has issued the finance and accepted the bond, the woman has a liability – to repay the bond. The banker on the other hand, has an ‘asset’ – the woman’s bond or mortgage. It is valuable to the private bank because unlike gold the loan generates income for every year that the woman pays interest. It is probably backed by the collateral of her existing apartment. Plus, the principal on her loan will probably be worth more in real terms when it is finally repaid. Governments raise finance from both the private finance sector, or from a central bank, in just the same way as an ordinary borrower raises money from a commercial bank. The government promises to pay interest, and offers collateral. The difference between a government’s bond and the woman’s mortgage is that a bond issued by a government with a good record of repayment is a more valuable asset. As such it serves as vital collateral (or ‘plumbing’) for the private financial system. The woman’s mortgage is also an asset, but will be less valuable because she may not have established a good credit record, and may be backed by just one income (her own). The government by contrast, is backed by a revenue stream from millions of taxpayers. That explains why government bonds (or government debt) are extremely valuable assets for the private finance sector. They are safe and reliable. They generate income (interest payments) on a regular basis. Debt as a security or asset can be used to borrow (or ‘leverage’) additional finance. Just as the ownership of a property enables a homeowner to re-mortgage and raise additional sums secured against that property, so safe, valuable financial assets act as collateral for the raising of additional finance. Newly borrowed money, guaranteed against either the original debt/collateral, or against the stream of interest payments derived from the debt, can then be invested, or lent on at a higher rate of return. To understand leverage, think of a homeowner who borrows £80,000 against a property worth £100,000 with just £20,000 in equity or capital. She has a leverage ratio of four. In other words, she has borrowed four times the equity/capital in her asset. At the time of its bankruptcy Lehman Brothers was said to have a leverage ratio of 44. That’s like having an asset that earns £10,000 a year, and then taking out a £440,000 loan secured against it, to go on a gambling spree. According to the Bank for International Settlements, Wall St’s investment banks started with a leverage ratio of 22 in 1990, which rose to ‘the dizzy height of 48 at the peak’. Leverage on that scale is most easily achieved against collateral that is as safe as public debt. The scale of wealth generated would be unimaginable to a present-day Croesus. There is another aspect to safe, public collateral not widely understood. That is how it is used in the shadow banking system – the private financial system that operates in the financial ‘stratosphere’, beyond the reach of states and regulatory democracy. Non-regulated bank-like entities that have scooped up the world’s savings (e.g. asset management funds, pension funds, insurance companies) hold vast quantities of cash. BlackRock for example, has $6 trillion in assets. These sums cannot safely be deposited in a traditional bank, where only a limited amount is guaranteed by governments. So to protect the value of the cash, the asset management fund will, for example, make a temporary loan of cash to another in need of it, in exchange for, or guaranteed by, collateral. This exchange is known as a repo – or repurchase arrangement. As Daniela Gabor has argued, the US and European repo markets, the largest in the world, are built on government debt. 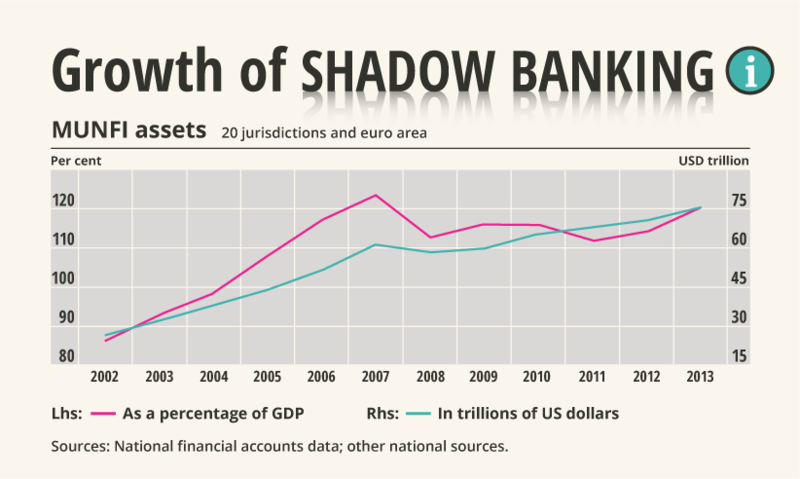 In other words, ‘the state has become a collateral factory for shadow banking’. The risks of this unregulated market for the global financial system, are scary. One reason is that while someone operating in the real world, say a homeowner, may only once be able to re-mortgage her asset or property, unregulated shadow bankers can use a single unit of collateral to re-leverage a number of times. Manmohan Singh of the IMF has estimated that by late 2007 collateral ‘churned,’ or was used roughly three times to leverage additional borrowing in speculative markets. That’s like using the value of a single asset – one’s property – to guarantee additional borrowing from three different banks. In the real world of financial regulation, homeowners are not allowed to do this. If we are to understand the history of how the rich have become immensely, grotesquely richer on unearned income, while earned income has fallen in real terms, leverage ratios against public assets in the both the real and shadow banking sectors explain a great deal. In short, the ability to regularly drain a government of interest payments, and to use the asset of public debt to leverage additional finance, is why asset management firms, private equity corporations, insurance companies, pension funds and financial speculators have massively increased their capital gains. It is also why secure government debt is in such demand. Private financiers can’t get enough safe government bonds – or public debt. The Great Financial Crisis (GFC) triggered a flight away from private debt and to the safety of public debt – especially the safest – British, European and US debt. This huge financial shock of the GFC led to a massive contraction of the global money supply, and threatened deflation – a generalised fall in prices – which would in turn lead to bankruptcies, unemployment and wage cuts. To counteract that threat, central banks – on our behalf – expanded their balance sheets and, in exchange for collateral (much of which was dodgy or ‘toxic’), provided extraordinary levels of new credit or liquidity to the private financial system. In the process, civil servant technocrats in central banks protected free-market players from bankruptcy and the discipline of the free market – dealing a considerable blow to the ideology. The deflation shock cried out for a massive fiscal response. There was an initial, but limited fiscal expansion, which led to what Credit Suisse called a ‘flood of safe collateral that caused public shadow money (Treasuries, mortgage-backed securities, US government agencies) to soar, fully offsetting the contraction in private shadow money (corporate bonds, asset-backed securities, and non-agency mortgages)’. As a result of the panicky demand for public debt, the price of government bonds rose, and because of the way the bond market operates, the yield (‘interest rate’) on bonds fell dramatically. Demand for public debt, greatly eased government borrowing (interest) costs. Pretty soon though, politicians and officials in government treasuries, cheered on by orthodox economists, right-wing think tanks and the media, soon fell back on neoliberal or ordoliberal theory, and imposed fiscal contraction – or austerity. Public investment – government spending – was either slashed or prevented from rising. These double standards –the expansion of finance for the private finance sector, and contraction for the public sector – are intrinsic to orthodox economics, but seldom challenged by the economics profession. As a result the production of government collateral (public debt) fell. 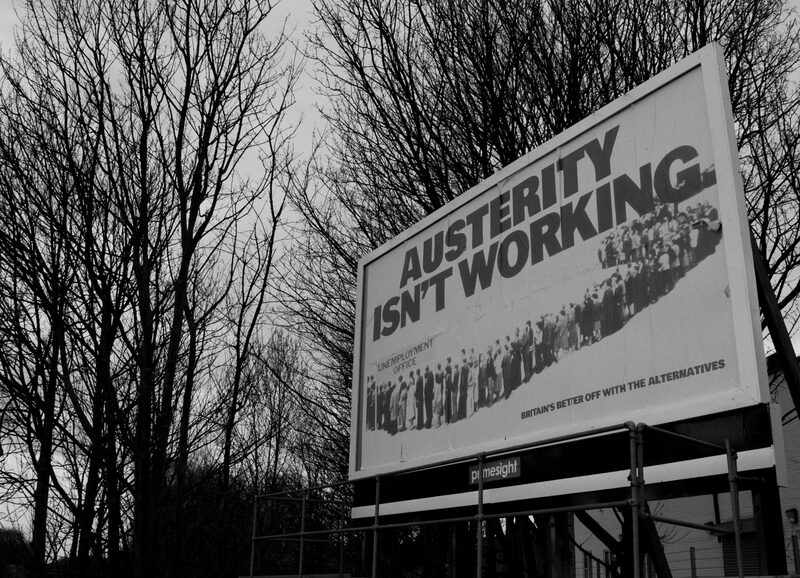 Austerity and the simultaneous wage freezes and cuts at first worsened the crisis. Since 2010, austerity has both prolonged the crisis, and held back recovery in the US and Europe. The effect of this backward economic policy was to increase insecure, low-paid, low-skilled and unproductive employment, while lowering wages across the board. In the US, while the initial Obama-led stimulus stabilised the economy, it was insufficient to restore long-term stability. Instead there were severe state and local government spending cuts, households were left to retrench after the sub-prime trauma, and wages fell in real terms. Between 2009 and 2014, inflation-adjusted wages in the US were flat or falling across a range of available wage measures. More recently, real wages grew, but growth rates for recovery as a whole still trail far behind the 2.0–2.2 per cent annual rates from 1947 to1979. As a result of austerity, the issuance of safe government debt contracted. Why should this matter? Because the low supply of government debt tends to boost (in fact, crowds in) the creation of unsafe private debt, or assets. These unsafe private assets are used instead by the banking and shadow banking system to expand borrowing and credit. Central banks rightly worry that such credit expansion on unregulated, dodgy assets will probably lead to another financial crisis. Understanding the value of public debt changes our view of it. Like a loan undertaken for a project that will create employment and generate income, public debt, if invested in productive activity, is a good thing. It generates income. Not just salaries and wages for those employed; not just profits for the private sector when salaries are spent on their goods and services; but also tax revenues. Income, corporation and consumer tax revenues, then used by government to repay the debt. Public borrowing and spending are especially important after a crisis, when the private sector is weak, and lacks the confidence to borrow, invest and spend. Yet most Chicago-school economists view public debt as a threat to the economy. Governments that cannot ‘balance the books’ are regarded as incompetent and hounded by the media. Hostility to public debt varies, but fear is embedded in the German psyche, because the word for debt – ‘Schuld’ – is the same as the word for ‘guilt’. Saint Matthew’s ‘forgive us our debts as we forgive our debtors’ was interpreted by Saint Luke as ‘forgive us our sins as we forgive those that sin against us’. Until we fully grasp the importance of public debt to the finance sector, immensely wealthy, globalised corporations will continue to parasitically extract rent from public assets; inequality worldwide will continue to widen; and we, the many, will become relatively poorer and powerless. Guilt, sin and the public debt are deeply intertwined, but only in the minds of economists, journalists and the public. Debt becomes something quite different in the minds of financiers and rentiers. To Wall St. and the City of London, the safe public debt of Britain, Europe and the US is a truly awesome and even phenomenal gift. They cannot get enough of it. When enough of us do come to understand this latent power, we will discover that another world really is possible. At the heart of neoliberal ideology – ideas shared by those that economic historian Quinn Slobodian defines as ‘globalists’ – is the belief that the state must shrink as a share of the economy. Second, that private capital markets must remain ‘free’ to roam globally and without friction. In other words, globalised capital markets must have the ‘freedom’ to be detached from the world’s states, and from democratic regulation. As explained above, the deep irony of the ideological obsession with self-regulating capital markets, austerity and the shrinking of the state is that private financial markets cannot function without the backing of governments, their taxpayers, and the safety of public debt. 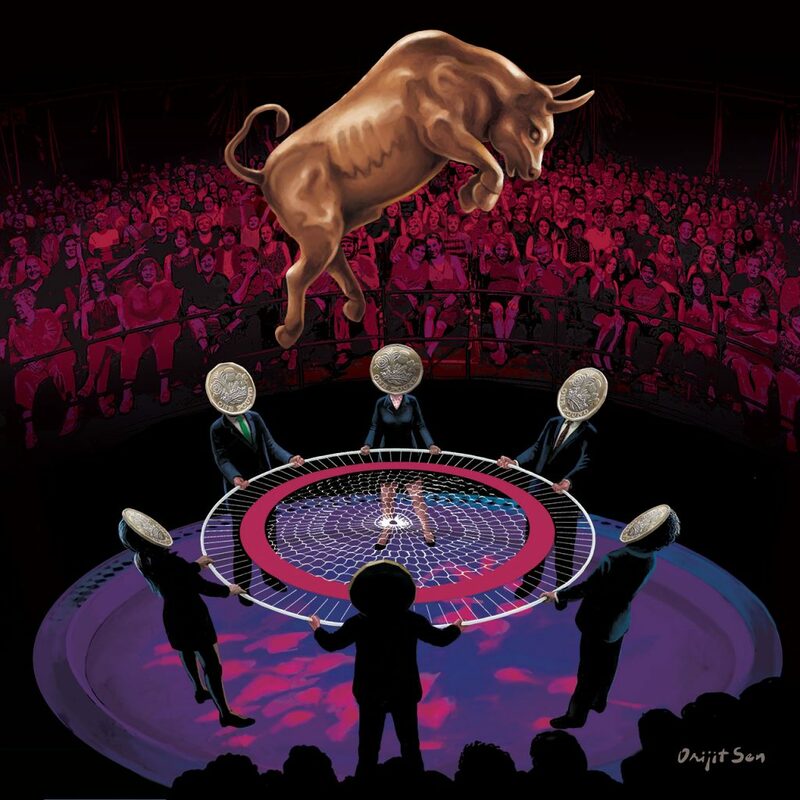 The ‘timid mouse’ that is the private finance sector cannot operate without the protection of the ‘roaring lion’ that is the public sector, to quote Mariana Mazzucato. Given that safe public assets are so fundamental to the stability of the private financial system, why would right-wing politicians and officials contract their supply? The answer can only be: ignorance, fed by ideology opposed to the collective role of the state. But what of the left? The Great Financial Crisis was met with shock and disbelief on the left. While many progressive economists had focused on the domestic, tangible economy – the state, markets, labour and trade – they largely ignored the intangible economy, the globalised finance sector. Social democratic parties turned a blind eye to a global, deregulated financial system that threatened systemic failure. In the meantime, many had embraced ‘globalisation’ – the ability to travel widely and draw money in any part of the globe; the ease with which globalisation facilitated the import of exotic fruits and vegetables; cheap smartphones; and the gifts bestowed by technology on the globalised system. These were all met with enthusiasm by social democratic parties that turned a blind eye to a global, deregulated financial system that both facilitated these activities, but also threatened systemic failure. These failures weakened the ability of the left to argue that at a time of catastrophic private economic failure, public investment in jobs was essential to restore social, political and economic stability. Instead taxpayer-backed subsidies and assets were deployed by central banks via QE to protect private profits and capital gains. No wonder the public revolted. A first in the many steps that must be taken to transform the economy is understanding. People cannot act to transform what they do not understand. Understanding how taxpayers guarantee and endorse the activities of the globalised, deregulated private financial sector, must be more widespread. Only then can we begin to demand ‘terms and conditions’ for public subsidies and guarantees – and to use that power to regulate and subordinate the globalised financial sector to the interests of society as a whole. To demand that public financial assets be used for public, not private benefit. This understanding is fundamental if we are to respond to the greatest security threat facing humanity: climate breakdown. Armed with understanding, we will then need a plan. The Green New Deal is such a plan. The genius of Alexandria Ocasio Cortez’s Green New Deal is that it provides a broad, comprehensive plan to transform the US economy and tackle climate breakdown. If the efforts of US Democrats led to an internationally coordinated campaign to implement it, the plan has the potential to transform many economies around the world, and to ensure a liveable planet in the future. But – and it’s a big but – a comprehensive plan for economic transformation will require financing on a grand scale, comparable to that of a nation embarking on war. We know that can be done. Governments have always found money to finance wars. Back in 1933, President Franklin D. Roosevelt’s plan – the New Deal - found money to fight a war against unemployment and poverty. His administration did so by overturning neoliberal economics, and implementing Keynesian monetary theory and policies. By ensuring that the monetary and financial system was managed by public, not private authority, his government raised the financing needed to lead the US out of the economic catastrophe of the Great Depression. Roosevelt’s New Deal not only created jobs and generated national income. It also tackled the ecological catastrophe that was The Dust Bowl. 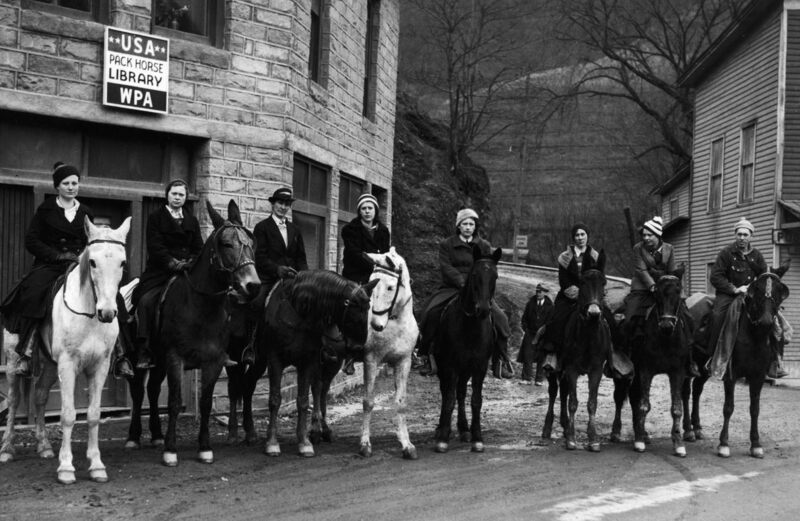 WPA packhorse librarians, ready to deliver books and other materials to remote rural areas in Kentucky, 1938. Photo courtesy of the National Archives. Implementation of the New Deal was achieved first, because the Roosevelt’s administration had a clear understanding of the nature of money, and of the publicly backed monetary system. But its success in tackling Wall St interests was down to political mobilisation, organisation and action. Roosevelt had the political courage and the political ballast to confront, and subordinate the interests of Wall St to those of society and the environment. Any international movement for a Green New Deal will have to summon up the same political courage in countries around the world. Campaigners will have to mobilise, organise and act to renounce the economic ideology that allows the 1% to grow fantastically rich on taxpayer-backed subsidies, bailouts and guarantees – while denying financial resources for public investment, economic and ecological transformation. Campaigners will have to discover, and then deploy, their latent power to subordinate global finance to the interests of society and the ecosystem. 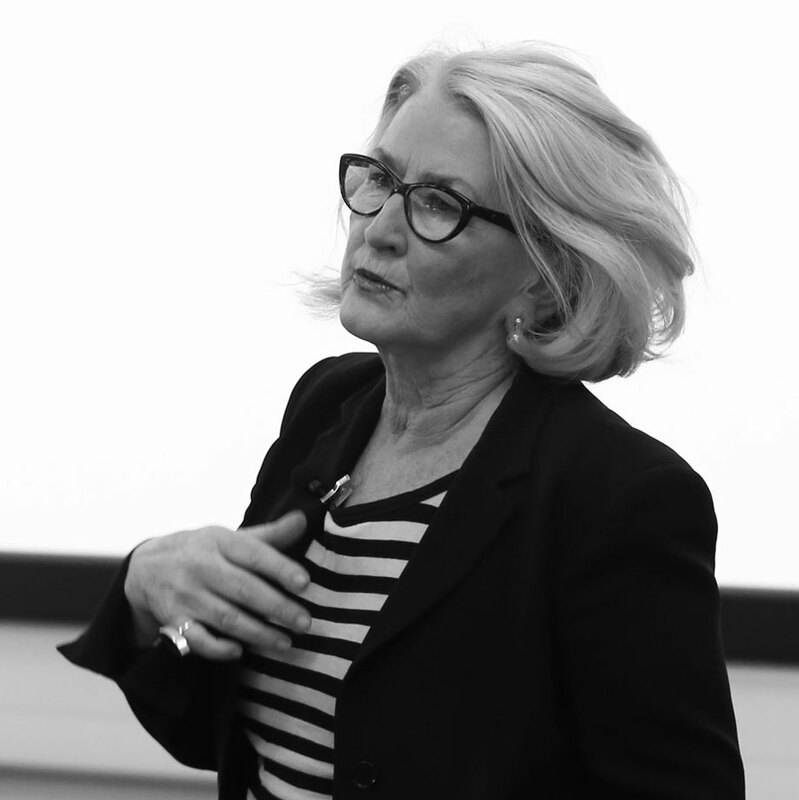 Ann Pettifor is a political economist, author and public speaker on the global financial & economic system, on money, monetary policy, and on the UK economy. Her latest book, The Production of Money (Verso 2017) explains the nature of money and the monetary system. She is one of the few economists to have predicted the 2008 economic crisis. During the late 1990s, she led a campaign, Jubilee 2000, which as part of an international movement resulted ultimately in the cancellation of approximately $100 billion of debt owed by the poorest countries. She is currently director of PRIME (Policy Research in Macroeconomics) a network of economists that promote Keynes’s monetary theory and policies, and that focus on the role of the finance sector in the economy.